UPDATE: Changes were made to the AAA in June 2015. Here is a link to the update. This is the third in a series on the Alabama Accountability Act (AAA) and how the various parts impact parents and families. This post, Part 3, is written to inform parents and families (1) who have a child zoned to a “failing” school, (2) are considering sending their child to a “nonpublic”, or private school but do not have the funds to pay tuition up front and (3) are considering seeking a scholarship from an educational Scholarship Granting Organization (SGO) to fund their child’s tuition. Additionally, I briefly mention what the rules are if you are considering donating to an SGO. No, we don’t yet know which schools are on The List of “failing” schools, so we don’t yet know which students’ families are eligible for the Tax Credits, let alone the Scholarships. The List will be produced by June 13. UPDATE: June 18: The List was released. Here’s a look at what The List does and doesn’t tell us. 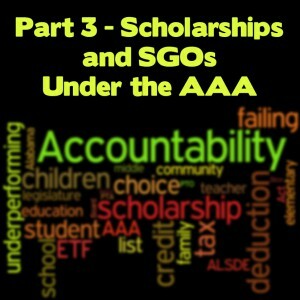 If you read Part 1 and Part 2, you learned that an SGO (I called them “ESGO”s yesterday, but have since learned the proper acronym is “SGO”) is a non-profit organization enabled under the AAA to collect donations and grant scholarships to Eligible Students (defined in the next paragraph) who are zoned to attend “failing” schools. An Eligible Student is one whose family income is less than 150% of the median household income, calculated at $64,000 in an al.com report. Once a student is deemed Eligible and is granted a Scholarship from an SGO, the student remains eligible through age 19 or graduation from high school, regardless of whether the family’s household income goes over that limit. In other words, it’s a one-time eligibility test. You must understand, though, that Scholarships are only available to students zoned to attend a “failing” school and that school’s grade span. So if the “failing” school is a K-5th grade school, but the school containing the 6th grade is not a “failing” school, then the Scholarship eligibility ends after the 5th grade. Re-read the section in Part 2, “Know the Big Picture and Long-Term Schooling Options for Your Child Before You Decide” if you are confused at this point. You must envision a long-term plan for your child before deciding which options to consider. All options available under the AAA are only available for children zoned to attend a “failing” school. If you plan to donate to an SGO to help an Eligible Student afford tuition at a private school, you as an individual can receive a tax credit for up to 50% of your tax liability, amounting to no more than $7,500 annually per individual or for a married couple filing jointly. The Alabama Policy Institute produced a policy sheet on the Scholarship program. A credit differs from a deduction. Talk to your tax adviser for details. You cannot designate your donation to cover a particular student’s tuition if you wish to claim the Tax Credit for your donation. A corporate taxpayer can be granted a tax credit for 100% of the donation (with no dollar cap) up to 50% of the corporate taxpayer’s tax liability. So you’ve been told that your child is zoned to a “failing” school. After considering your options (Part 2 of this series), you have decided to send your child to a private school, but don’t have the funds to pay the tuition.Your household income is less than 150% of the annual Alabama median household income, which means your child is Eligible to receive a scholarship from an SGO. Your task at this point is to find a private school that (a) meets the definition of a Qualifying School and (b) will accept Scholarship money from an SGO. After you find the school, you have to find an SGO that will grant your child a scholarship. Don’t get overwhelmed. Any sort of financial aid and scholarship-seeking necessarily has strings attached. Stay focused. As these SGOs form, they will probably attach themselves to private schools, and it may end up being a one-stop shop: when you find the school, the SGO might be ready and waiting to fund your child’s tuition. You must do your research. This is your role as your child’s parent or guardian. This is where you are empowered to make choices for your child’s education. Do not expect public school officials to help you with this research. They will most likely not be happy that you are removing your child from the public school. Additionally, be cautious of anyone knocking on your door offering your child a Scholarship to attend a private school. You must do thorough research to ensure your child is enrolled in an excellent private school environment. UPDATE: June 24: A list of SGOs will be published on the Alabama Department of Revenue’s (ADOR) web site on August 1. Don’t bother looking before then. July 1: Forms for those seeking SGO status are available on ADOR’s web site. a. Has been in existence for at least three years. b. Has daily attendance of at least 85 percent over a two-year period. c. Has a minimum 180-day school year, or its hourly equivalent. d. Has a day length of at least six and one-half hours. e. Requires all students to take the Stanford Achievement Test, or its equivalent. f. Requires all candidates for graduation to take the American College Test before graduation. g. Requires students in high school in grades nine through 12 to earn a minimum of 24 Carnegie credits before graduating, including 16 credits in core subjects and additional requirements in health and physical education, fine arts, computer studies, and foreign language. h. Does not subject special education students to the same testing or curricular requirements as regular education students if it is not required in the individual plan for the student. i. Maintains a current website that describes the school and the instructional program of the school. So the school either has to be accredited by AdvancEd or meet the guidelines (a) through (j). Here’s a list of private schools in Alabama that have been accredited through AdvancEd. It lists 176 individual schools and both Catholic school districts in Alabama. You will recall from yesterday’s post that there were 390 private schools on the 2009-2010 federal list of private schools. So it appears that less than half of Alabama’s private schools are accredited. It is your job to find out whether the private school in which you are considering enrolling your child is accredited. You need to ask the private school officials, “Does your school meet the definition of a Qualifying School under the Alabama Accountability Act?” That is a simple question and good private schools will know the answer immediately. If they are unsure, ask for a time they will know for sure. If they are unable to tell you when, in my opinion, you should be wary of the school’s competency. Remember that SGOs will only be able to grant scholarships to students who attend Qualifying Schools. The next question is whether or not the private school is willing to accept scholarship monies from an SGO to fund student tuition. Some private schools have already indicated that they are unsure whether they will accept scholarship monies from SGOs because of the state accountability requirements that will be tied to the acceptance of the monies. I expect Alabama’s private schools will be making those decisions over the coming weeks to prepare for next school year. Again, do your research. 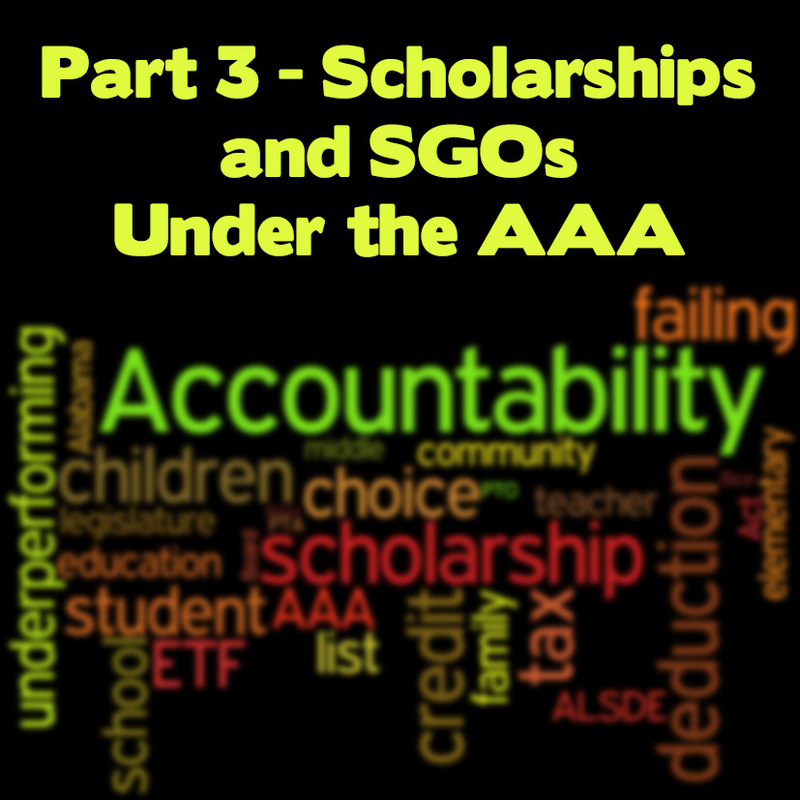 Do not assume that all private schools will be willing to accept SGO-granted scholarships. You need to ask the school, “Are you willing to accept scholarship monies from an SGO?” If they are unsure, ask for a time they will know for sure. If they are unable to tell you when, in my opinion, you should be wary of the school’s competency. Are you willing to accept scholarship monies from an SGO? In addition, recognize that tuition costs can be very high at some private schools, so you must be sure you know how much of the tuition the Scholarship will cover. The AAA does not limit how much money can be awarded per Scholarship or per student. UPDATE: June 24: ADOR will publish a list of qualifying nonpublic schools on their web site on August 1. This is the Great Unknown for me at this point. I have been unable to locate any information about SGOs in Alabama, of course, because they just now were authorized in the state of Alabama. In other states, SGOs appear to be attached to a school or a group of private schools, and that may well be how they develop in Alabama. I found this web site listing SGOs in Rhode Island. Here’s an SGO from Indiana. Here’s an SGO that formed within the Catholic schools in Indiana. Recognize that every state’s laws are different, so our SGOs may look and act differently from these examples. UPDATE: June 24: ADOR will publish a list of qualifying nonpublic schools on their web site on August 1. July 1: Forms for those seeking SGO status are available on ADOR’s web site. 1. Annually administer either the state achievement tests or nationally recognized norm-referenced tests that measure learning gains in math and language arts to all participating students in grades that require testing under the accountability testing laws of the state for public schools. 2. Allow costs of the testing requirements to be covered by the educational scholarships distributed by the scholarship granting organizations. 3. Provide the parents of each student who was tested with a copy of the results of the tests on an annual basis, beginning with the first year of testing. 4. Provide the test results to the Department of Revenue on an annual basis, beginning with the first year of testing. 5. Report student information that allows the state to aggregate data by grade level, gender, family income level, and race. 6. Provide graduation rates of those students benefiting from education scholarships to the Department of Revenue or an organization chosen by the state in a manner consistent with nationally recognized standards. So the Qualifying School will have to agree to do all of those things among others set forth in the AAA in order to accept monies from the SGO. Section 9 of the AAA details all of the requirements. Time will tell if these requirements prove to be too big of a barrier for Alabama’s private schools to open their doors to SGOs and the students who need their funding to attend private schools. UPDATE: June 24: ADOR issued proposed rules stating that any nonpublic school wishing to participate under AAA (meaning receive approval for parents to be granted tax credits or receive scholarship money from SGOs) must meet these requirements. I originally believed that only those nonpublic schools who received scholarship money from an SGO were required to meet the 6 requirements listed above. I was obviously wrong. My apologies. Parts 1, 2, and now 3 of this series were meant to give parents and families a look at how the AAA might actually apply to their children. Much work is left to be done, from creating The List of “failing” schools, to creating SGOs that will grant Scholarships to Eligible Students. And let’s PLEASE not forget about the Flexibility option. Because the Flexibility option applies to ALL of us, regardless of whether our children are zoned to attend a “failing” school. The Tax Credit and Scholarship portions will necessarily generate a lot of paperwork for those wishing to take part in those options. This will not be a journey for the faint at heart. This will require effort and perseverance. And with that said, I believe there should be one more part to this series: Part 4 – Staying in Your “Failing” Public School – How to Make It a Better Place for All Children. Because if you are willing to work this hard to find a better school for your child, you may want to consider putting your efforts into improving your “failing” school. I have some ideas that I’m looking forward to sharing…..check back tomorrow. As always, let’s discuss here (with the new Facebook comments ability!) or on the Facebook page.